Yes my machine made me cry… a lot. I remember trying to think of so many excuses as to why I didn’t need the machine when in hindsight if I have no machine, I have no business. Let me take you back to a hen do in Liverpool, my friend Amy Norris (was Fothergill) was getting married, her hen do was in Liverpool and I remember sitting in a Gin bar, talking to a lovely group of ladies about the future, as you do, I explained I had taken redundancy and was thinking of doing a course of some kind possibly laser Hair Removal and Tattoo Removal, with that, a lady called Verity turned around and said she had her own clinic in Toddington doing exactly that and started her business 7 years ago! It was like she was my angel and she has continued to be just that… Verity invited me up to her clinic, bearing in mind I hadn’t even started my course or anything yet, she felt it was important for me to see exactly what goes on. Verity welcomed me into her clinic with open arms, we sat in her lovely reception and she explained everything, from paperwork, to insurance, to products and prices, to equipment and consumables, we talked for ages, she then invited me into her treatment room, where all the magic happens, and there, I was greeted with two big machines and this is where I heard the name Lynton for the very first time. We put on the goggles and Verity showed me how the machine worked, I’m not going to lie I was pretty nervous. Verity has a Lynton machine, along with a Cryo Cooler, Verity went on to tell me about the advantages and the importance of both machines and how they complement each other. (A Cryo Cooler is basically an air conditioning machine it provides a rapid, controllable and effective pain relief of freezing cold air), after looking at the machines we then went through and looked at Verity’s reviews and results – before and afters and they were unbelievable, her work is just magic! I left Verity’s clinic knowing that if I was ever going to do this I knew I wanted a Lynton Machine, the results were just amazing. Although we live miles apart, myself and Verity are still very much in contact, I aspire to be as successful as Verity and her wonderful clinic. Check out some of Verity’s work – Toddington Laser Clinic Portfolio. I come away, scared and excited, scared because there was just so much to think about and I just didn’t think that little old me could do something like this, the what ifs were hitting me hard and fast, but I was also excited, I had fire in belly and anyone that knows me knows I’m determined, passionate and motivated and whatever I put my mind to I will give it 100% and more. 3 months later I started my course… 6 months later I purchased my machine. Steve from Lynton Lasers come to meet me, we spoke about models and costs and contracts and I settled on a Lynton Lumina with a Q Switch (for tattoo removal). Let’s just say the amount of money I spent on the machine I could have put a deposit down on a house…I cried… a lot… then I got the nervous giggles, the what ifs were still hitting me hard and fast but I would rather say I tried, tried my hardest to make it work, then never to have tried at all! You only live once after all and this was my one and only chance to build a future for my family. I tried to think of so many excuses as to why I didn’t need the machine, Steve and Jamie (my other half) were laughing at me, but actually without a machine I had no business, this was the last thing I had to do….after I signed on the dotted line, Steve took me for a very large glass of WINE!! Once it all sunk in, I was so happy with my choice, I could have gone for a cheaper machine, but I wanted a machine that delivered results (like Verity’s) my clients are going to be at the heart of my business and I want to give them the best. 2 weeks later I then went on to buy a Cryo Cooler, I was then ready to take on the world. My machine is British manufactured, medical CE-marked and listed on the NHS supply chain. The Lumina combines multiple aesthetics technologies into one stand-alone platform. 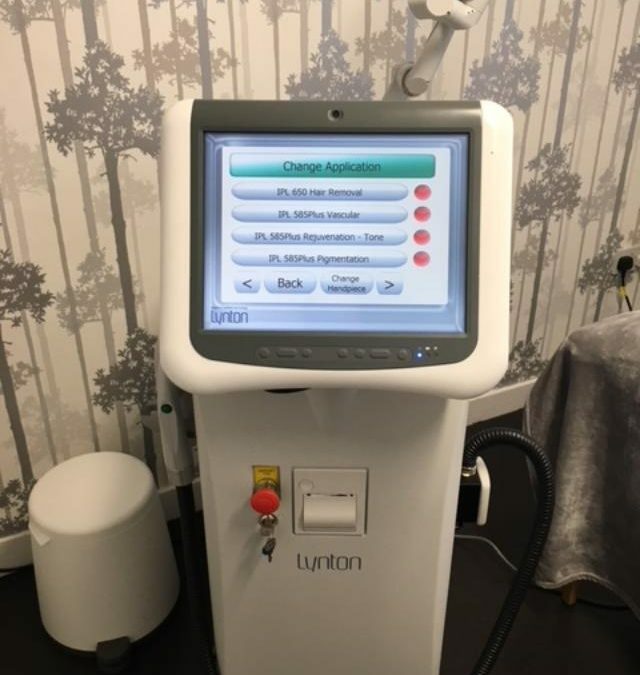 You can treat over 24 different aesthetic concerns, which includes some of the UK’s most in-demand treatments for example, professional laser and IPL hair removal on all skin types, multi-colour tattoo removal, anti-ageing skin treatments and skin resurfacing (skin resurfacing is something I will add to my machine in the future). 9 months on I haven’t looked back, I offer free consultations and I encourage people to take advantage of this, purely so everyone gets to meet me, see the room, meet the machine, understand how it all works, the process, aftercare, side effects and much more. If you have ever considered having anything done please get in touch, it would be lovely to hear from you. I would just like to take this opportunity to thank Verity at Toddington Laser Clinic and also Steve and the team at Lynton Lasers, your support and encouragement has been amazing and I will be forever thankful and grateful for the time and effort you have given me.